This is some kind of mojo in this burrito de pollo!! April 12, 2015 ~ Trevis Dampier Sr. The precise origin of the modern burrito is not known. It may have originated with vaqueros in northern Mexico in the nineteenth century;farmworkers in the fields of California’s Central Valley, in Fresno and Stockton; or with northern Sonoran miners of the 19th century.In the 1895 Diccionario de Mexicanismos, the burrito was identified as a regional item from Guanajuato and defined as “Tortilla arrollada, con carne u otra cosa dentro, que en Yucatán llaman coçito, y en Cuernavaca y en Mexico, taco” (A rolled tortilla with meat or other ingredients inside, called ‘coçito’ in Yucatán and ‘taco’ in the city of Cuernavaca and in Mexico City). Every time I go to a Mexican restaurant and I order a wet burrito there is usually some kind of red chili/enchilada sauce that is used. 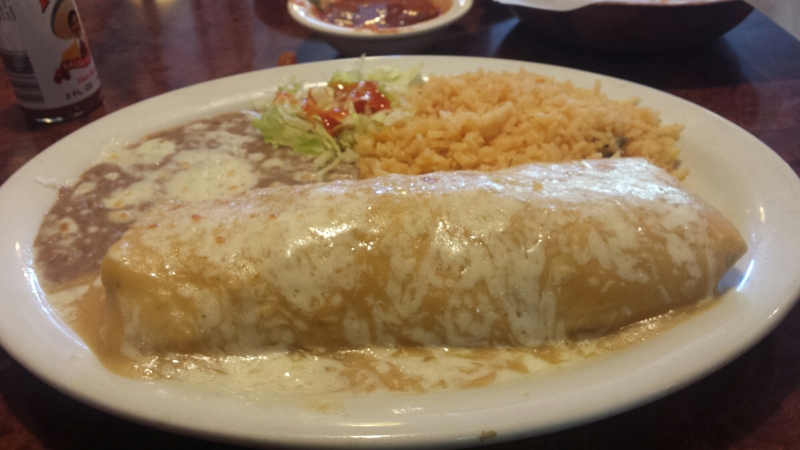 El Caminito is the only place I know if where the wet burrito has a light brown sauce over it that is so divinely created and tasty you think it was created in the heavens. They have a shredded chicken so tender that it almost tastes like there is butter mixed in with it. Anywhere else the chicken would have been fat chunks of sliced chicken. They also add perfectly cooked refried beans and cheese to the burrito with cheese blended in with the sauce on top of the burrito as well. If you are in the Sunnyvale, Ca area and are looking for a great place for Mexican food then this is where to be. Good job El Caminito! True live action eating! I hope you all are having a great Sunday. This makes for a great Sunday meal so hopefully this gives you an idea on your next food adventure. Thanks for joining me on today! I look forward to seeing you on the next run. Keep hope alive! < Previous No ifs ands or buts. .I want me some cold cuts!! Next > What’s not to love about Korean grub! !